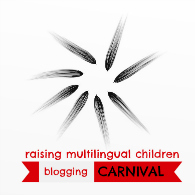 Today, I have the immense honor to host the March Multicultural Kids Blog carnival on the topic of Asian crafts and activities. In fact, I am posting this on my son’s birthday (who was coincidentally 100% made in China! ), which makes it even more special to me. Some of you know that I have a real affinity towards Asia. 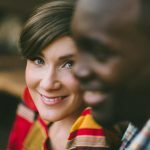 Living in China at the beginning of our marriage gave us a beautiful firsthand experience with a culture quite different from our own. However, with all of the life-changing and wonderful things that have come from our time spent in Asia, we now realize how ridiculously unprepared we were to move there back then. I am embarrassed to admit that we first read the Lonely Planet China travel guide as we were flying to China! Needless to say, our landing was quite rough. If there is one thing I have extracted from that time, it is that we want to equip our kids to be much more prepared global citizens. 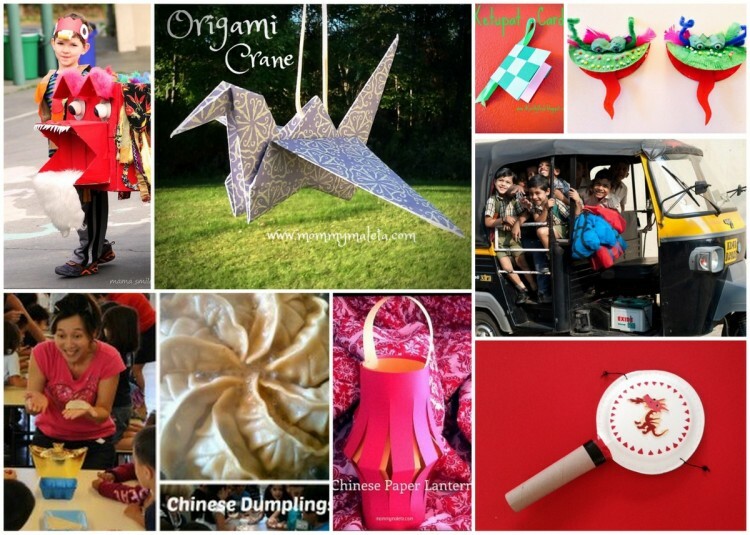 Wouldn’t it be beautiful if Asian crafts and activities were part and parcel of a bigger picture, of our children learning about Asia and, in so doing, embracing the world around them? Without further ado, here are some of the ways my fellow blogging friends from around the world have brought Asia into their households. I had so much fun reading through their creative ideas and I really hope you do as well. Make sure to click through to their posts as they very often contain a wealth of resources beyond these quick teasers here and don’t forget to leave them some comment love! Learn about India through artwork, temples and sculptures. Through fascinating pieces of world art, Cindy of ARTCURATORFORKIDS teaches children about Asia and art. Her country specific posts are wildly engaging and informative with follow-up questions and activities to boot. 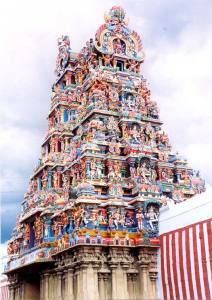 Learn about the Meenakshi Amman Temple in Madurai, India and how it has 33,000 sculptures and attempt your own mural on butcher paper. Or, take a look at a lovely Korean silk folding screen and try to place the unfolding (pun intended!) story on the screen in front of you. Whether you are looking to study artwork from China (read this post and this one), Thailand, Kazakhstan, or another country, it is well worth bookmarking Cindy’s corner of the web for her fantastic insights and discussion starters. Lisa guest-posting on THEEDUCATORSSPINONIT writes about the Art and Science of Bonsai gardening and how the Bonsai was thought to have been brought from China and later made famous in Japan. Lisa illustrates how Bonsai gardening with kids can be a very hands-on way and visceral way to learn about this region of the world. Marie-Claude and her family spent a whole year studying China and even so, she believes they barely scratched the surface of Chinese history and culture. I thoroughly enjoyed Marie-Claude’s rich summary post on their year on MARIE’S PASTICHE and admire how they were brave enough to try cupping, cooking with new ingredients and their hand at calligraphy. Well done, Marie-Claude! 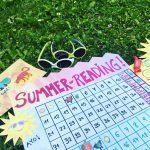 If you don’t have a whole year to dedicate to a country, how about finding a community event and setting aside a day like Amanda did on THEEDUCATORSSPINONIT? Amanda and family took part in a local Chinese New Year Family Day and were able to enjoy cultural performances and artwork and make different crafts. Still no excuse for those of you with only a half a day to spare however! Within this time frame, Frances of DISCOVERINGTHEWORLDTHROUGHMYSONSEYES offers two brilliant ideas to celebrate Chinese New Year: 1. Host a Chinese New Year culture party for kids or 2. Organize a cultural playdate. I am so impressed by Frances and her endless creativity and research, let alone her courage for contacting a local university to find a Chinese student excited about sharing her culture with the children (and adults!) present! That playdate will surely hold very long-lasting memories. Eva of EVAVARGA also celebrates Chinese New Year with her darling children. She does so by preparing a few traditional dishes and giving her children Hong Bao (red envelopes) and inviting them to sing a catchy New Year song. Also for Chinese New Year, MaryAnne of MAMASMILES documents how her son’s class participated in a dragon parade and proved that a diverse student body on the other side of the world can indeed rally together in appreciation for the holiday and younger children parading. Oh, and don’t miss the slew of activities linked up at the bottom of MaryAnne’s post. Leanna of ALLDONEMONKEY describes a fun little Chinese Zodiac game you can do at home for Chinese New Year, with the possibility to ratchet up the difficulty level to accommodate toddlers and older children. Maria offers some helpful suggestions for celebrating Chinese Mid-Autumn Festival on TRILINGUALMAMA. Her post comes complete with a review of a top-notch Chinese music CD for children called A Little Mandarin as well as a Pinterest board full of ideas from baking mooncakes to literature on the topic of Moon Festival. Eva from EVAVARGA also writes about Moon Festival in great detail and even includes a few riddles to “fight the tiger” and a couple of romantic poems in Chinese characters, pinyin and English. After the holidays are done and dusted, it’s of course still possible to learn Chinese. Eva writes about clever ways Laoshi Shawn teaches Mandarin to Jie Jie on BETTERCHINESE by taking them on a scavenger hunt with their smartphones where they are encouraged to follow directions. In another post, Eva describes the great value of building language fluency through pictures. I love her encouraging reminder that the small steps you take today, gradually build up over time, as you can see in the sweet video of her daughter Meili. Finally, if you have the means and the courage, why not send your child to school in Asia for a day! Stefania from SCRAMBLEDNEST describes her son’s day in the shoes of a schoolboy in Pune, India. Talk about bragging rights back home in Luxembourg for the rest of your life! Experiment with Chinese traditional music by making your own Bo Lang Gu. How about learning about Asia and unleashing your child’s creativity at the same time? Daria from TINYTAPPINGTOES celebrated the New Lunar Year by making a Year of the Sheep gong. You can make one yourself by using her pdf tutorial, which even includes each of the Chinese New Year animals to decorate your gong with! 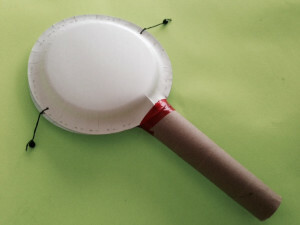 And if the gong rattles your cage just a bit too much, why not try making the cutest homemade pellet drum, or Bo Lang Gu? The Bo Lang Gu dates back to the Song Dynasty in China and is part of religious rituals in Tibet, Mongolia, India, and Taiwan. The Bo Lang Gu produces a really unique sound as small beads or pellets attached on a string bounce off the drum. For some reason, Chinese New Year doesn’t feel complete without colorful little dragons. In her guest post on CRAFTIEMUM, Angie and her young children make the most gorgeous paper plate dragons you will ever come across. Lantern Festival marks the end of the Lunar New Year. This Chinese paper lantern by Laura of MOMMYMALETA might not float away in the skies, but it won’t burn your fingers and can be made with kids! In all its teeming diversity, Asia seems to be united in its fondness of kites. Carrie from CRAFTYMOMSSHARE explains how she and her daughter learned about Asia through kite making. Did you know that kites carried different messages based on their shape? I certainly didn’t. Also, did you know that India’s national animal is the Royal Bengal tiger? Learn more with Laura of MOMMYMALETA and make these two fun crafts: tiger striped nail polish and stinking cute tiger handprints. Just so no one feels left out – the first is for older girls, the other for younger children. Through crafting, Laura travels from India to Japan to find out that making origami cranes isn’t in fact for the faint of heart. The trick might lie in the paper, or the fold, or the artist – who knows! Discovering that scrapbooking paper makes a decent origami paper substitute and having smart daughters helps immensely. Leanna of ALLDONEMONKEY gets creative and crafts a beautiful model Ger to learn about Mongolia and nomadic life. As a bonus, watch a fascinating video on her blog of an actual Ger being built. Koloud from ACRAFTYARAB and his family were inspired by the visual beauty of Ketupat, or Malay dumplings, to make a clever Ketupat inspired notecard that you might post on a friend’s doorknob during Ramadan. Practical crafts are the best! 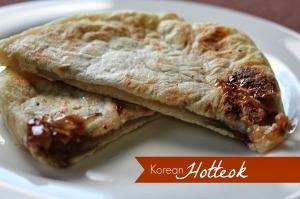 Discover Korea by cooking with your kids! After all that crafting, what better way to nourish the body and feed the mind than with a hands on activity that so many kids love: cooking! Leanna from ALLDONEMONKEY explores Korean cuisine by preparing a pumpkin traditional savory rice porridge called Jook. Read right to the end to find a Korean Cinderella story to accompany your homemade Korean treat. What could bring you closer to China than to make dumplings for Spring Festival? Amanda from MISSPANDACHINESE invites families to make jiaozi together using her recipe. As a bonus, there are a few language tips at the bottom of the page. Try your hand at making sushi in your own home like Amanda’s family did from THEEDUCATORSSPINONIT. My own sushi making experience tells me that it is way harder than it looks! Still, Amanda even got the kids and the grandparents involved in selecting herbs and hand rolling their Japanese delicacies together. For desert, Carrie from CRAFTYMOMSSHARE makes Kanom Gluay, a type of Thai banana cake and discovers a surprise ingredient: rice! Don’t miss the selection of Thai cookbooks and storybooks as well as Thai dishes linked up in this post. Marie-Claude from MARIE’S PASTICHE ventured out to make Korean Hotteok with daughter Elle in their exploration of pancakes from around the world. They kindly share a tutorial style recipe of this sweet pancake. Not so kind not to share the oozing goodness with us, Elle! If you have ever wanted to make Thai Roti with banana, look no further. Marie-Claude has done that with her children as well, clearly having a blast in the process. Check out her Mongolian Gambir recipe too, best enjoyed reading the books below, of course! Read all about Japan through beautiful storybooks and publications like this. 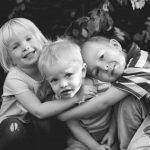 Leanna from ALLDONEMONKEY shares three books about Mongolia she has read with her boys. They are mainly geared towards early readers. Thanks to these books, Leanna’s boys have virtually visited a Ger, learned about local geography and culture, all while sipping on some salty Mongolian milk tea. Yes please, sounds delightful. Amanda of MISSPANDACHINESE presents her 12 favorite childrens books to learn about Spring Festival and Chinese culture. They are vibrant and colorful albums worth owning. I can only agree with her review of the Chinese Nursery Rhymes book + CD being a joyful way to learn culture through singing. We are now in possession of this book and have been joyfully belting out “dang woooomen tong zai yiqi , qi kuaile wubiiii“ at most red lights. Following a previous review on CRAFTMOMSSHARE, Carrie describes All about Indonesia, which includes information on how to make your own batik, prepare Dadar Gulung or create cool little shadow puppets, Carrie shares her experience with the book All about Japan. 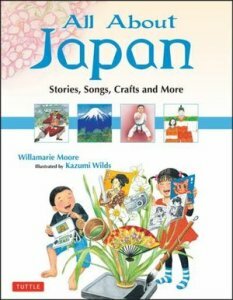 Told from the perspective of children who live in Japan, young readers learn about daily life in Japan, poetry, music, recipes and more. Let’s be honest, who hasn’t wanted to make Mochi? Thanks to this well-rounded book, her 6 year old daughter Hazel has. Incredible. Finally, Laura of MOMMYMALETA reviews The Pearl of Bengal, a mystery book with Indian geography and history as the backdrop. Storytelling is such a natural and excellent way to learn and remember in Laura’s experience. Let me know in the comments below if you end up trying any of these ideas for yourself or if you have any other Asian activities and crafts you’d like to share. Thank you to all the bloggers above for sending in such great suggestions! Thanks for all your hard work putting this post and carnival together! This was no small task!! And thank you so much for your input, Laura! I need to try those tiger handprints on my kids! What an amazing resource. Thank you for putting it all together! Absolutely, Amanda and thanks for your contributions as well!